I last wrote extensively on The Mayor's Vision for Cycling in London shortly after it was announced, in March 2013. We are now 18 months on, so I thought I would try to assess 'how it is going'. About £900 million was earmarked for spending over 10 years on these, but only £370 million was expected to be spent by May 2016, the rest of Boris Johnson's tenure as Mayor, with the rest being dependent on the wishes of whoever is elected to replace him. Now the first thing to say is that the rate of progress has been disappointing. Summer is the usual time for spades to be put in the ground for major work on the roads. I thought a year would be adequate for Transport for London to put their plans in place and assemble the correct staff, and that we would probably see something happening this summer. But summer passed, and nothing much happened, except a draft of the much-delayed, and in the event exceedingly lengthy and somewhat un-focused London Cycle Design Standards document was released for consultation. (See the excellent Cycling Embassy response on this.) The Cycling Commissioner, Andrew Gilligan, has been giving talks everywhere, and press releases have been common, but there's been no spades in the ground. What has been built in the last 18 months was either in train before (as was the Cycle Superhighway 2 extension), or the result purely of a borough initiative (as was the rebuild of the Royal College Street cycle track). On the other hand, though it is getting going painfully slowly, there are signs of a seriousness to the project that go far beyond what we have been used to seeing before in the politics of UK cycle provision. I have, for example, actually watched (sad, benighted creature that I am) the examination of the chief officers of the project, including Gilligan and Lilli Matson, TfL's Head of Delivery Planning, by the GLA's Budget Monitoring Subcommittee. It is very clear if you watch this that we are in a rather different world to the borough Town Hall meetings of old where a 'Cycling Officer', a rather unimportant council employee who happened to be quite keen on cycling, would turn up before a few pretty uninterested councillors in a dirty yellow lycra suit and explain how he proposed to spend a few thousand pounds on painting some lines on pavements. Now, we have people establishing the serious business case for the expenditure, monitoring and auditing by actual outcome, of how many cycle journeys are generated, for hundreds of millions of pounds spent across a city of 10 million people. This is a hard-headed world which is little to do with wanting to 'look green' or create a bit of good PR with 'cyclists', but everything to do with keeping a major city moving and keeping it in business, and spending public money sensibly and effectively. So what of the four programmes? In brief, if you haven't got time to read further, I'd say this: The Cycle Superhighways are now looking quite promising as the standards, programme and timetable for them is becoming clear. The timetable, nature and likely ultimate success of the Central London Grid is much less clear, and that is because TfL doesn't control most of it, the boroughs do. The programme for the Quietways is becoming slightly clearer, but the standard of implementation is in doubt. There seems to be a problem with people understanding the nature of the Quietways; Andrew Gilligan seems to have to keep explaining it again, and that must be his fault for not being clear enough from the start. The mini-Hollands still have not progressed sufficiently to draw any conclusions. According to Gilligan at the budget subcommittee, around half of the total budget for Superhighways (£209m) is scheduled to have been spent by May 2016. The initial four superhighways that were created by painting the road blue – CS2 from Stratford to Aldgate, CS3 from Barking to Tower Gateway, CS7 from Merton to The City and CS8 from Wandsworth to Westminster are promised to be re-engineered 2016. However, the only one for which we have seen plans is the notorious CS2. These are being consulted on currently (ends 2 November), and look worth supporting, containing a large element of segregation, though the solution for Bow Roundabout is still sub-optimal, and a further round of improvements here is promised at a later date. Then there are the two 'new' un-numbered Superhighways, known as the East-West (previously 'Bike Crossrail') from Tower Hill to Acton, and the North-South from Kings Cross to Elephant & Castle. 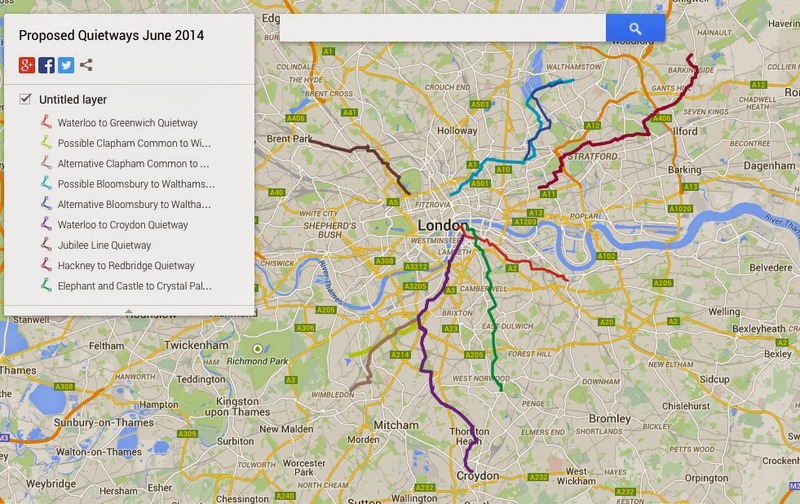 These are due to be completed by May 2016, except for the Westway section of the East-West. They are being consulted on now (here and here). You should act quickly to respond, if you have not already done so: consultation closes 2 November. The plans have been well-received by campaigners and bloggers, being again for mostly segregated tracks achieving a generally high standard of provision and capacity. These new Superhighways also meet two of the main criticisms levelled at the original Superhighways plan: that the routes didn't go into the centre, and they didn't connect up. These two Superhighways will cross at Blackfriars north junction, though they will be at different levels there. They will be connected by a major junction remodelling, converting one of the current slip-roads off the bridge into the connecting two-way cycle track. Construction of all this will mark the final success of the Blackfriars campaign that this blog covered extensively in 2011. What is now being offered. Sustained campaigning and protest by thousands of people put this on the table as a realistic possibility. The plans for the East-West and North-south Superhighways are really not complete at all. The North-South, in particular, seem not to deserve its name, as it is just a 'stub' compared to the far more important East-West, and most of what has been planned is south of the Thames, further emphasising the Superhighway network's already very strong south-of-the-Thames bias. Far from getting anywhere near 'north' London, it peters out in the backstreets of Clerkenwell's existing Seven Stations Link (London Cycle Network Route 0) in the Ampton and Cubitt Streets area, seemingly baffled by the King's Cross Gyratory. It could connect with Camden's proposed route on Midland Road up towards Camden and Kentish Towns ultimately, but still it seems disappointing in concept compared to the East-West route: we might have expected a high-profile main road route up at least as far as Kings Cross. 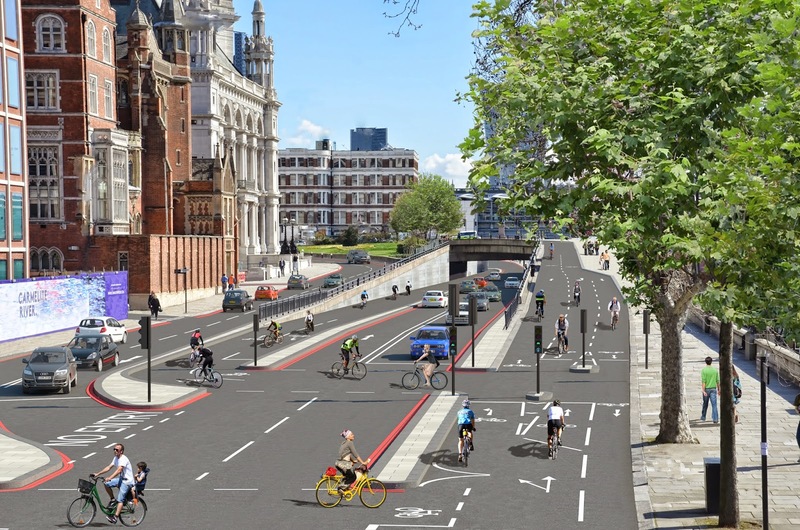 However, let's not be churlish: with a good segregated cycle track on Blackfriars Bridsge, we could finally declare the Battle for Blackfriars won. There are still big gaps in the East-West plan, mostly concerned with the Royal Parks. What to do at St James's Park and in front of Buckingham Palace still has not been decided, though the suggestion of replacing the horse ride by Constitution Hill with a cycle track is a good one. Andy why, at the chaotic Wellington Arch, why do TfL propose 'a larger shared space to replace sections of grass to provide more space for pedestrians, cyclists and horses'? Why not just have clear dedicated routes so everybody knows where they are? Using the Carriage Drives in Hyde Park is a good plan, as they don't get disrupted by the park's frequent commercial entertainments, but these sections have not been designed yet. Different options are given in the Lancaster Gate area, and the idea for using the elevated A40 Westway to Acton seems still sketchy: further consultation on this is promised in 2015. On the other hand, the plan for The Embankment, Bridge Street and Parliament Square is a clearly-defined game-changer: a high-capacity, high-profile two-way cycle track driven right past the Houses of Parliament and across the formerly intimidating and hostile gyratory of the Square. For this section alone the plans would deserve massive praise, and the scale and ambition of the East-West and North-South Superhighway concepts overall demand that all who are interested in the environment of the city and its transport network, whether they cycle or not, show their support. Of the other Superhighways, CS5 Belgravia to New Cross is supposed to be finished by the end of 2015, and there may then be an extension east of New Cross. The plans for extensive segregation of the inner section, Belgravia to Oval, were consulted on this Summer, and look quite good. The outer section will use semi-segregation, we are told, but the exact character of this does not seem to have been decided. CS1 City to Tottenham will not be on the roads originally planned, it will be on smaller roads, and possibly built by Autumn 2016. CS11 from Regents park to Brent Cross is also due to be finished by Autumn 2016. It depends on Westminster and the Royal Parks agreeing to the closure to through-traffic of the Outer Circle. It will thence run up Avenue Road, Finchley Road and Hendon Way, but we have see no plans for this so far. CS4 Tower Bridge to Woolwich is supposed to be finished by 2017, and a new (so far un-numbered) Superhighway is planned on Lea Bridge Road in connection with the Waltham Forest mini-Holland project. CS9 which should have gone from Hyde Park to Hounslow has run into opposition from the Royal Borough of Kensington and Chelsea. It looks like TfL will only be able to progress the sections in Hammersmith & Fulham and Hounslow, and the timetable for these is currently unclear. That's a total of twelve Superhighways, the number originally projected, though they are not all in the originally projected locations. The original CS12 Angel to Muswell Hill and CS10 Hyde Park to Park Royal have been abandoned. CS10 is supposedly replaced by the East-West route on the A40, but this means, with the original CS11 alignment having been moved east, from the A5 to the A41, that Brent, quite an inner borough (though technically an Outer London one) will have been completely left out of the Superhighways programme. I have to say I take all TfL's projected completion dates with a massive bag of salt. We were told, after all, in late 2012, that CS5, 9, 11 and 12 would be launched in 2013. Well, clearly the rethink on the whole nature of the CSHs after LCC's Go Dutch Campaign and the appointment of Gilligan as Commissioner caused that three-year delay. But the longer timescale is for the best if what we get is actually good. The designs we are seeing now show a step-change in quality from what we were offered before. Problems tend to come at a few places at big junctions where there is slightly too much emphasis on mixing and sharing with pedestrians: we need separation and clarity to allow flows of both cyclists and pedestrians to continue to grow and co-exist in harmony. 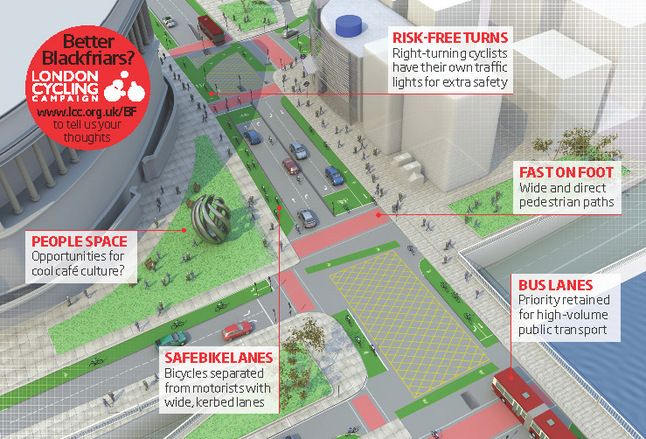 We need efficient cycle routes and we don't want pedestrians to get intimidated. But the basic battle for space and separation from heavy flows of traffic seems to have been won. The Grid is the name given to the combination of Superhighways and Quietways in Central London. We have a map of the Grid, and we have the Superhighway plans so far as they go, and we have solid proposals for some of the Camden routes, but that seems about all. We have little indication of the standard that the boroughs other than Camden will apply to the Quietway routes. We have had one Quietway proposal from Southwark (QW2) in detail, and this has been criticised in detail elsewhere, with suggestions for how it could be better. It seems likely to fail LCC's criteria of vehicle flows below 2,000 PCU per day and speeds under 20mph with the design that has been proposed. It seems that the problem is political will from the borough to cut the minor-road rat-runs (like Tabard Street, which is parallel to the A2 and should not be a through-route), and it looks very likely that this kind of issue with the Grid Quietways will be repeated more widely unless Boris Johnson and his aides can somehow bring more persuasion to bear on these boroughs. I've written about the inadequacy of many parts of the Grid plans before. The problem is basically one of the Mayor trying to promote changes on roads he doesn't control. One answer would have been for him to have included more TfL roads in the Grid. Kensington and Chelsea is most obviously not playing ball, and Westminster's commitments remains very vague, which is deeply worrying since, as can be seen, much the largest part of the Grid is in Westminster. The general lack of concrete plans by the boroughs for implementing the non-Superhighway elements of the Grid at the moment makes it look very likely that little of the Grid will have progressed beyond the paper stage by May 2016. Where directness demands the Quietway briefly join a main road, full segregation and direct crossing points will be provided, wherever possible, on that stretch. We will use judicious capital investment to overcome barriers (such as railway lines) which are often currently only crossed by extremely busy main roads. Subject to funding, land and planning issues, we will build new cycling and pedestrian bridges across such barriers to link up Quietway side-street routes. This was always going to be a prescription that was hard to apply in many places in Outer London, where 'low-traffic back routes' are not very available or useful, and therefore the joining of main roads might not be so 'brief'. I pointed out last year how the level of funding allocated to these routes did not suggest that many intractable problems that require heavy engineering solutions, such as the mess of railway and main road corridors that makes the centre of the Borough of Brent quite impenetrable by bike, could actually be solved within the limits of this programme. It soon became clear that Sustrans and some people in the boroughs were interpreting the Quietways as being necessarily, and thus limitingly, on quiet roads, and being necessarily low-intervention, which is, of course, what the name does suggest. However, Andrew Gilligan had repeatedly said that where no satisfactory back-street route exists on the desired alignment, Quietways can be on main roads, and they can be high-intervention, i.e., physically segregated. This raises an unanswered question of how bad the backstreet route has to be before the backstreet idea is abandoned. The other question which remains unanswered is the same as for the Grid: how prepared will local councillors be to actually cut the rat-runs to make back-street routes attractive? The planning for the Quietways, so far as it has got, seems to have been rather secretive, and LCC has only with difficulty managed to compile this plan, low-res version below, of roughly where the first routes are currently proposed to go. It appears that this map shows the very most that will be achieved by May 2016. It will be seen that Andrew Gilligan's early concept of naming routes after tube lines that they follow has been abandoned, except for the Jubilee Line Quietway. This one seems a poor shadow of what he promised last year, when he spoke of a route from Central London to Wembley. Here is is shown stopping short of the North Circular, at Dollis Hill. The fact that there is a serious intention to extend it beyond the North Circular is indicated by an announcement of funding for a new cycling bridge over the A406 in Brent (and also another in Redbridge), but the timescale for these larger Quietway interventions seems to be beyond this mayoral term. The Jubilee Line route, like CS11, depends at its southern end on the Royal Parks and Westminster agreeing to the closure of Regents Park to through-traffic. Through Camden the route, oddly, is only one or two blocks away from CS11, and then it follows an old LCN route in Brent, which requires more mode-filters and reversal of priority at junctions with other minor roads if it is to be made much more attractive than it is now. There's no guarantee of local councillors agreeing to measures like this, and little the Mayor can do to make them. So the worry is about standards. It's all very well to draw these lines on maps, but if the routes are fiddly to use, and traffic levels remain as they are at the moment, and on many roads, such as Maygrove Road and Chapter Road on the Jubilee route, cyclists just get squashed into tightly-parked narrow corridors with cars trying to get past them, then the Superhighways will prove far more attractive to all cyclists, of whatever level of experience, than the Quietways, which were supposed to be the routes 'particularly suited to new cyclists'. 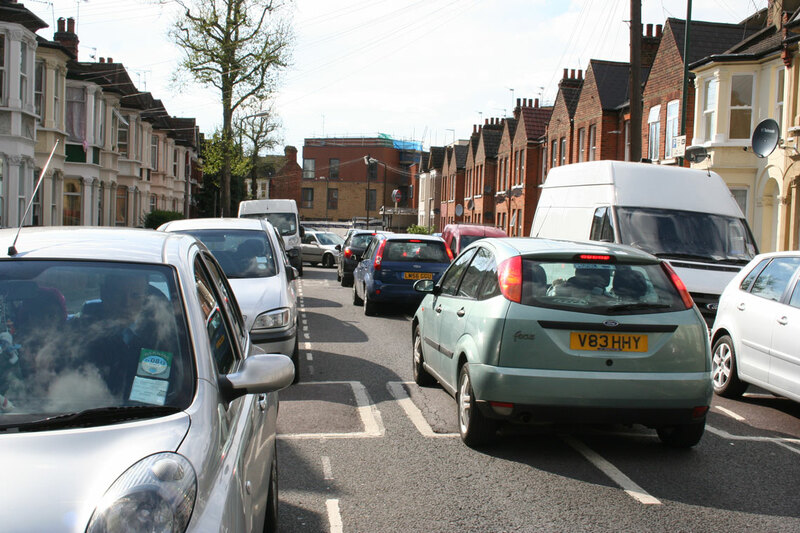 Chapter Road, Brent, as it is at the moment, part of the the proposed Jubilee Line Quietway. Perhaps the most serious problem for the inner Jubilee Line route occurs where it meets West End Lane, West Hampstead, which it has to follow for a short while to connect between side-streets, because there is no other way to cross three railways. Traffic on this road is far above a 'quietway' level, but there is also no space for segregated lanes, and no realistic political prospect of closing this quite important local through-route to motor vehicles. Sustrans' proposal for this location has been a fanciful 'shared space' repaving, rejected by Camden Cyclists, rightly, as quite beside the point. This situation points to a fairly deep conceptual problem with the Quietways. Andrew Gilligan wrote in the Mayor's Vision that the Quietways would exploit London's 'matchless network of side streets, greenways and parks'. Where are the links in this network, exactly, and how should conflict be resolved at places like West End Lane? Again, the most advanced of the Quietway plans seems to be CS2 in Southwark and Greenwich, which Gilligan has indicated will be delivered by 2016 subject to planning permission for a new path along the railway past Millwall Football ground. Bits like this could prove to be good and could justify the name 'Quietway", but examination of the map above will show that, in general, Sustrans have not succeeded in identifying the apocryphal 'matchless network of side streets, greenways and parks', because, of course, it is not a continuous network, and could never be made into one within the constraints of the funding offered, not to mention the realities of local politics. The concept is not entirely without merit: it is not that different to the orbital Green Routes plan of Copenhagen that I covered in my blogpost on that city. The political climate there, however, is sufficiently different, through cycle culture being sufficiently established, that the complete removal of traffic, parked and moving, from minor streets, and their conversion to genuinely green pathways does really occur. It is hard to see that happening immediately in many places in the London suburbs. On a pessimistic assessment, it looks like the Quietways could become just a third attempt at the London Cycle Network (following Ken Livingstone's failed LCN+ project), on very similar routes: a byword for complex, inefficient, out-of-the-way routes that most cyclists will avoid and which will not significantly encourage cycling in Outer London, where encouragement is most desperately needed. What I would really have liked to have seen would have been a far better-funded equivalent of the Superhighways project specifically targeted on strategic main road sections in Outer London that would often be orbital, not radial routes. There are one or two projects coming from the boroughs that do approximate to this: there is currently a consultation out from Hounslow on possible cycle tracks on Boston Manor Road, the A3002, with proposals that look really rather good. I think this kind of thing, solving specific outer borough link problems, is likely to prove a more effective expenditure of funds than the very distributed low level of funding not achieving consistent high quality that is possibly emerging as the pattern for the Outer London Quietways. A major cycle hub will be created and the plaza outside Kingston station will be transformed. New high-quality cycling routes will be introduced together with a Thames Riverside Boardway - a landmark project which could see a new cycle boardwalk delivered on the banks of the river. The town centre will be completely redesigned with segregated superhighways linking destinations, three cycle hubs delivered across the Borough and new greenway routes introduced. A semi-segregated Superhighway route along Lea BridEnfge Road will be developed as well as a range of measures focused on improving cycling in residential areas and creating cycle friendly, low-traffic neighbourhoods. These are funded to the tune of £30 million each. The Enfield project seems to have proved most locally controversial, with shopkeepers mobilising against it, and the Enfield Cyclists organising a counter-campaign of demonstratively spending money in shops to try to prove the power of the 'pedal pound'. The most actual action so far has been seen in Walthamstow, where a series of temporary experimental road closures were put in and then taken out again. This is like the '20 bollards' game, where you have only twenty bollards to distribute around your town, and you need to position them to most effectively reduce rat-running traffic to create useful new cycling and walking routes and enhance local life. Again, reaction has been mixed, but there seems a lot of positivity around the Waltham Forest mini-Holland, and campaigners seem to think it has a good chance of being accepted by the community, and forming a good template for other Outer London town centres in the longer term. But broadly, because the selection process took so long, not enough has actually happened in the mini-Hollands yet to write much about them. The selection procedure itself, the holding of the competition, was I think one of Andrew Gilligan's aims, successfully completed. It did get some previously pretty cycle agnostic, or even hostile, local authorities to start seriously thinking about radical change to kick-start more cycling in Outer London, lured by the cash promise, and the fact that the subject seemed to be suddenly in fashion, and that this was the project of a Tory mayor, potentially outflanking the Left on a 'green' issue. It remains to be seen whether anything from these unsuccessful mini-Holland bid plans will see the light of day; Gilligan has promised in letters to the boroughs that some projects will be pursued, and has budgeted for a number of mini-Holland 'consolation prizes' to finance the best ideas that came out of the competition in the non-winning boroughs, including the two new bridges across the North Circular I have already mentioned. Implementation of these however seems to be beyond 2016. How to summarise? It has been difficult writing this post. I have started several times, and had to rewrite because of new developments and announcements. The Mayor's project is now gathering pace. A couple of months ago I would have made a much more negative, perhaps slightly bitter, assessment of where it had got to, compared to the promises of the Vision document. But now we have seen more of the new Superhighway designs, we can see that our campaigning over the last four years or so has been a success: it has produced a mind-shift in the ambitions of the people tasked with designing cycle facilities in London. The mind-shift of course has not spread to many local politicians, who have direct control over most of our roads, and therein lies the rub. There is plenty more campaigning that needs to be done, in fact, there will never be an end to it, as David Hembrow points out from the example of the apparently miraculous Netherlands. LCC had exactly the right idea with its Space for Cycling Campaign for the local elections: taking very specific demands for each ward right to each local ward councillor and candidate. This did have an effect, rather like the mini-Holland competition process, of making a few more people think properly about the issues, or at least start listening to the arguments, for the first time, though I don't expect miraculous results from it of all the ward 'asks' actually being delivered in the next few years. It was a stage in a process. London's cycling revolution will certainly spread from the centre outwards, and the Superhighways will carry it to the suburbs. In the foreseeable future it will remain quite limited, though. The target of 5% mode share by 2025 might well be achieved, but this would still leave most Londoners out from the benefits that cycling can provide, which is rather sad, and it will also limit the success of the city overall. We've see a tremendous reaction from business leaders to the Superhighway proposals, and it's been found that a vast majority of ordinary Londoners support them as well. I always expected this kind of reaction to visionary, transformative proposals for our streets; I have said repeatedly in this blog that this is what would happen if you put to people a striking, coherent vision for change. I said this was why we in the cycling world should stop messing around asking for scraps that nobody really could see the point of, and should start to think far bigger, about what a real cycling and linked quality of life revolution would look like in London. There is now a growing realisation that London needs to compete with other world cities in terms of the quality of life it offers to a highly mobile skilled workforce. Competing on salaries or low levels or either personal or corporation tax is not enough. It is this economic driver that is increasingly recognised, and will increasingly be recognised, as the impetus for change. This should encourage Boris Johnson and his aides and officials to become even more bold in laying down the infrastructural basis for the cycling revolution before he leaves office. We need all the other Superhighway plans quickly, and we need top quality maintained at the difficult places with many competing demands. We need better control and more up-front leadership over the Central London Grid and the Outer London Quietways to prevent any money being wasted on cosmetic projects which fall short of the best standards. We need the Royal Parks Agency, the Corporation of London, the City of Westminster and Royal Borough of Kensington and Chelsea to come unambiguously on board and we need to find ways to put pressure on the from every angle, from residents, businesses and commuters, to do so. We need flexibility over the definitions of the various projects, so it is clear to all that we can have segregated tracks funded on long stretches of main road in Outer London, and this in fact becomes a thing that is expected. We need the major essential linking infrastructural elements such as the new North Circular crossings delivered more quickly. We need more funding for Outer London and plans for a second round of mini-Hollands after 2016 to start to develop a real usable cycling grid outside the centre. Finally, the Mayor and GLA need to get a grip on miscellaneous 'third-party' development projects, such as, in my part of London, Brent cross Cricklewood, and Old Oak Common, and ensure that everything built in them meets the Cycling Level of Service in the London Cycle Design Standards. There should be no question of more major road junctions being rebuilt in London without high-quality cycle provision. There is progress, but the gap between London and the best places for cycling in world continues to grow. We continue to lose further generations of children to cycling. We continue to see illegal levels of pollution in our city, and massive levels of pollution-related disease. We need to be sober. Cycling appears quite popular at certain places and certain times in London, but we're really still in the remedial class of world cities for cycling. Cycling still hasn't made the breakthrough to become the obvious method for most people to consider for short, routine journeys. Our roads still feel, and, are, far too dangerous. We need to continue to demand far more. We can't let up. The consultations on the East-West and North-South CSHs were extended by a week – the deadline is now 9 November so there is still time and I hope many will respond favourably. The excellent cyclingworks.london campaign/website has brought an unexpectedly large constituency of business supporters, but I'm sure support from 'ordinary cyclists' and even potential cyclists will be taken seriously too. There is still the slight possibility that TfL will be landed with a court battle to get them through and a high level of popular support would be pretty important in that case. Fantastic post, great summary, and balanced. This is a good point. In his answers to the Budget Scrutiny Committee Gilligan mentioned a 'transformative' scheme coming to Kings Cross, saying the latest changes were only a stop-gap. This seems a curious way to proceed, and it's never been announced that there are officially two stages to the main junction rebuilds. But who would have thought in 2011 that we would be facing another Blackfriars rebuild 5 years later? It's like they are caught on the hop all the time, there's a huge lag in the system which we can't see. I responded to the consultations on the East-West and North-South CSHs several weeks ago. Around then I also wrote to my immediate boss and the CEO where I work, which is just off Fleet Street, asking if they would support the proposals at a company level through the CyclingWorks site. However, I've had no response at all to any of my three emails. In the first I explained what the proposals are, and in the second let them know the deadline had been extended. I added a bit about how the CSHs would benefit everyone at work even if they will never cycle on them, and outlined the potential health and environmental benefits for the city at large. Today I wrote again to remind them of the approaching deadline and ask if they had any specific concerns either about supporting the proposals - or just replying to me - that I could try and address for them. It's sad but even with a few days left I think I'm not going to have any joy with this. Well-done for trying anyway. You could point out the vast scale of support from London businesses for the CSHs shown on the cyclingworks website, and point out what great free PR those companies are getting from having pledged support. Indeed - I mentioned that, too!